our sojourn to zimbabwe began at the johannesburg international airport on friday, april 13th... hmm, friday the 13th... that could explain some of the shenanigans that were about to ensue. we arrived with our host, mr. klomp, and we met up with a few of his bain south africa co-workers, hugh strange (on transfer from the new york office), and lucy arthur (on transfer from the london office), who were accompanying us on our victoria falls vacay. we were in excellent company. as we were about to board our british airways flight, a flight attendant pulled me aside and asked if i had anything else to wear. i took a look at my ragamuffin outfit (a light zip up hoodie, an ugly tee with a cat on it, my camo cut-off shorts and my sneaks -- not exactly my sunday best, but we're backpacking for crying out loud) and answered that all my clothes were in my checked backpack... was there a problem? yes. i wasn't allowed to land in zimbabwe wearing camoflauge. due to the recent political unrest and a very paranoid, power hungry president, robert mugabe, i'd be arrested at the airport. um, but i'm a harmless looking (unfortunate looking was more like it) white female with no intentions of starting a coup... arrested?? seriously?! the flight attendant told me that a week earlier on the same flight, a 14 year old boy was locked up for wearing camo shorts when he entered the country. i started to panic. the flight attendant just stood there staring at me with a worried look on her face and was offering up no solutions. matt and i asked her what our options were, and she phoned up her superior to help assess the situ. whilst she was away, i decided that if i turned my shorts inside out and put my hoodie around my waist, no one would be able to tell that my shorts were camo. the flight attendant thought that was a good idea, so once she let us take our seats on the plane, i shimmied my shorts inside out and prayed for the best. landed. as i had suspected, victoria falls airport (as opposed to harare international) is about as low-key as they come, and no one harrassed me about my funny outfit, thank goodness; but that initial pseudo-encounter with the zimbabwean government was a real eye opener to the police state of the country. we learned that it is illegal to say anything negative about president robert mugabe or the government and is punishable by up to 10 years in prison. if you are caught complaining about high prices, you are also subject to arrest. the zim dollar is experiencing a hyper inflation of around 4000%, so the currency isn't even worth the paper it's printed on. 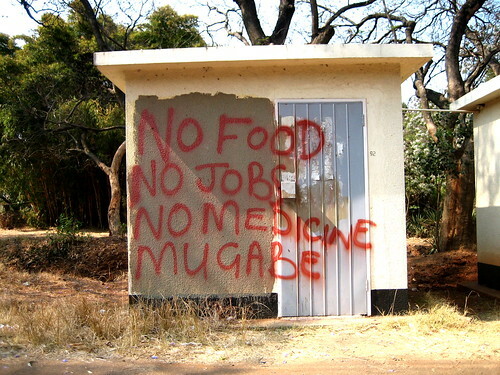 the concierge of our hotel told us not to go anywhere near a zimbabwean atm... the money would be worthless. a couple of decades ago, zimbabwe was once one of the most well-run countries on the continent; now life expectancy is in the 30s for both men and women, disease is rampant because zimbabweans can't afford to buy medicine (or even bread for that matter), and many of the well-educated are fleeing to nearby zambia and south africa. there are so many issues i'd like to write about, but i'll leave you with that small taste. what a wild place we were in.